OMG! Has it been two weeks? How have you been? I've missed you much! Yup, it's been quite awhile since the last post I know. To put it simply, I've been faced with too many 'make it work!' moments lately which left me with precious little time where I chose sleep over blogging. The Spring 2011 fashion week has already kickstarted in New York and I have yet to view any collections completely on style.com. Loads of catching up to do, plus a massive list of unread posts on bloglovin', which I finally finished going through yesterday. Amazingly, with all the madness, somehow I managed to squeeze time out or more like I had to have a time-out to attend my friend's Mimi hen parties (2 parties on different days). 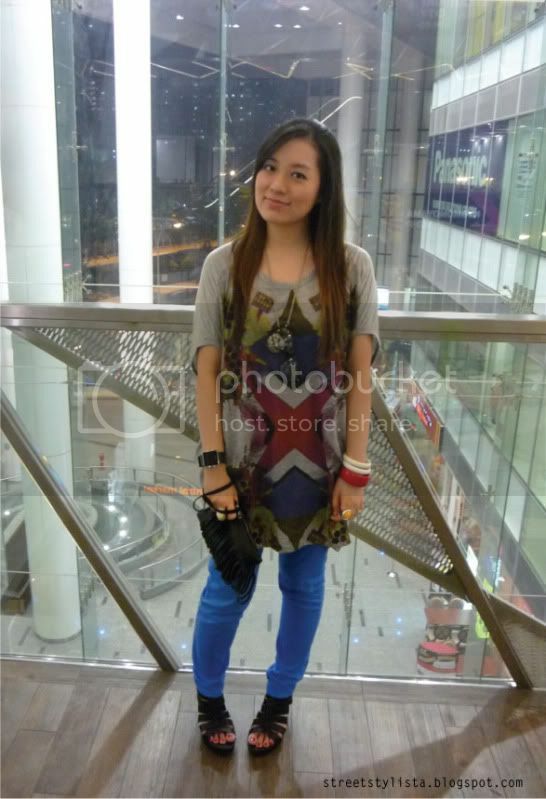 Top from Isetan, F21 Jeans, Shoes (my fav!) from CP, m)phosis Fringed Clutch, Accessories & Specs from F21 & Far East. This was my outfit for the first party which had a retro theme. Ok I know it's not exactly that retro, but I literally had to throw an outfit together like a few hours before the party so I had to work with whatever I could find. Ended up wearing as many bright colours as possible and I also brought my nerdy specs along and some hair accessory to retro-fy the look whenever needed. 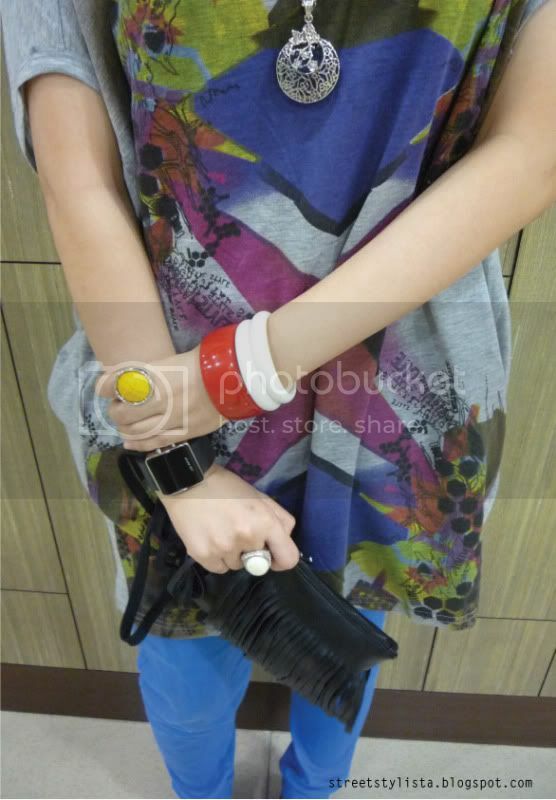 I also realised the colours of my accessories somehow matched the colours of the top. Then again, the top has like basically all the colours possible. Haha. So anyway, we went to Helipad (my first time there) which I actually think is quite a boring club. I much prefer the chill out place on the rooftop above. The night was filled with lots of camwhoring and lol tasks the brides-to-be had to complete which was pretty fun to watch. Our second party the following weekend was just the bride and a small group of close friends. That ended up being a marathon ktv session (6+hrs!) instead of the pre-planned hen party. Lady Gaga, BEP, Wonder Girls, Super Junior, A*Mei, you name it, we sang it. It was mad fun. 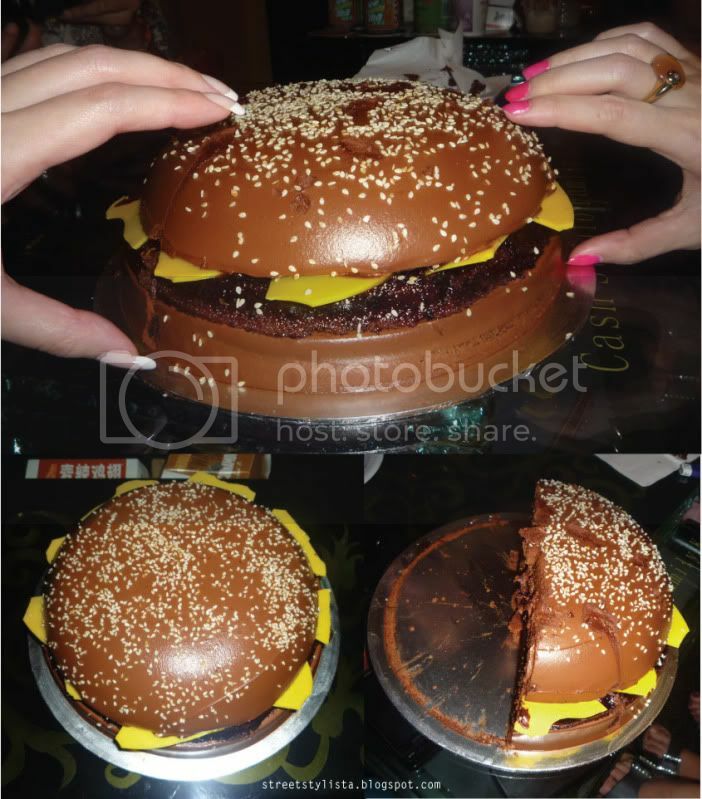 We also had a mini early birthday celebration for Mimi with this burger cake which is one of the funniest birthday cake I've seen. Love it! I've already requested for a Chanel bag cake for my birthday next year! Haha. that cake made me laugh. and I was curious to know how to eat something sweet with salty appearance. lovely blog, cute outfit btw :) that hamburger cake looks so real!